The following amusing tale of a police chase after some apple stealing rouges was recalled in The Limerick Reporter and Tipperary Vindicator, 24 August 1858. Time– Five o’clock in the morning. Scene– The Abbey river, enveloped by a slight fog by which the upland is partially covered – the trees and corn-fields, meadows and slopes, with the cattle grazing, seen dimly in the distance – the Abbey river, Thomand-bridge, Baal’s-bridge, and Mathew-bridge, lying as they now lie, and will lie, as long as they can stand- the city buried in sleep, with the exception of some early risers. Dramatis Personae– Two young scoundrels running for their lives with a bag of apple – a gentleman, whose orchard has been robbed, running as if for life, and crying out, “stop the thieves” “stop the villains,” “catch the robbers” – at his heels a posse of the night watch, shouting also “oh, the villains, we’ll catch them, we’ll bone them”- some police, with a constable at their head, are partially distinguished through the fog. Resounding up the foggy way. And take the water with mighty splash. With his watermen around looking d-lish queer. A chase by a gentleman whose orchard had robbed of a bag of apples by two youngsters, and who proved, by their skillful manoeuvres and artful and successful dodging, to be an overmatch for their pursuer and the posse commilalus of watchmen and police which he had at his heels. 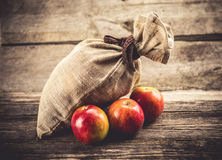 It has not been discovered, even from the busy tongue of rumour, hie the worthy gentleman found out the operations of the youths in his apple trees, but it must be presumed that he did not take his measures with his usual foresight and preenution, for the marauders were “beg and baggage,” as the saying is, off the premises, and giving “leg bail” before the forces has arrived and were properly disposed so as to intercept their flight. and brought their bag of apples with them – then making to the river, they dashed into a barracoon , and by the aid of a pole and paddle, pushed into the stream, where to use a nautical expression, although not altogether appropriate here, they lay to on their oars, and commented to use “light and cheerful discourse” with their pursuers, to whom they threw out some apples, which, they said, would be refreshing after the long run in the fog. 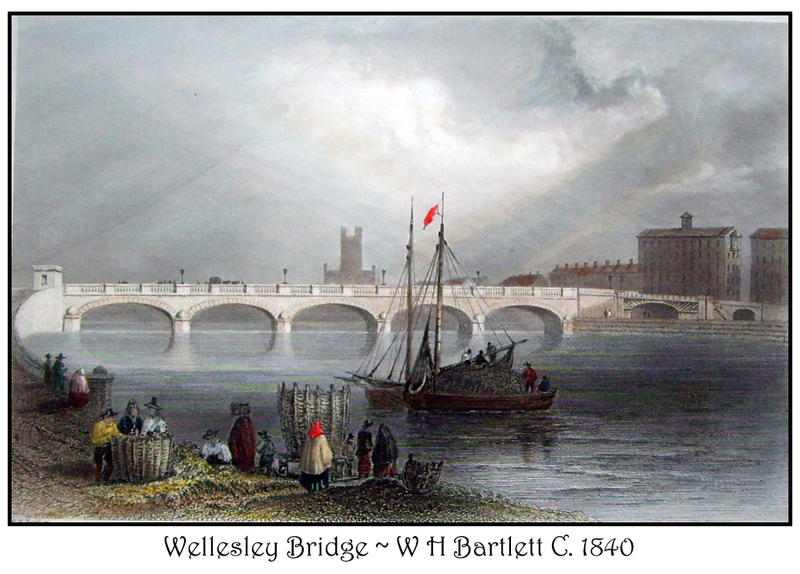 Engraving of Wellesley Bridge, Limerick, Ireland by J C Armytage from an original drawing by W H Bartlett dating from around 1840. By this time several of the police had arrived on the scene, but how to get at the impudent scoundrels in the boat was a question which would puzzle a conjuror to solve, at length, and after a long debate, one more adventurous than his fellows rushed into the water and attempted to seize the boat, when he received a punch in the lower stomach from the pole which sent him on his beam-ends is the water, and this cooling his ardour, he did not attempt a second seizure. The youths then stretched away towards the island point rounded it, keeping their course towards the distillery and Thomand-bridge, the police and watch marching on the banks. Having passed the bridge over Curragower stream, some of the police took to boat in pursuit of the fugitives who were nearing Mathew-bridge, which they soon cleared, leaving their pursuers far behind, who were shortly afterwards obliged to give up the chase, the barracoon having proved herself the superior craft in the rapids. The pursued now betook themselves to their poles, and having nobly stemmed the current, they arrived in safety above Bual’s-bridge. At this time the Artillery were going to exercise their horses, and they seeing something extraordinary in the river, with the police and crowds of people on its banks, became spectators of the scene, and followed as best they could the eccentric course of the boat, which was at length shot into the deep waters of the mighty Shannon, and after its hardy occupants had given the police, and watchmen, and spectators, three cheers, they steered off towards the Salmon Weir, under the railway bridge, upon which were more policemen, with whom also they interchanged some civilities. Having rested on their paddles near the weir for some time, they returned, again rounded the Island point, down the Abbey river, again under Baal’s Bridge. Mathew Bridge, the police and watchmen keeping them in view all this time. But here they bid them good bye, having taken their course towards Cratloe, where, it is presumed, the golden pippins which grew in the orchard at Corbally were treated to the same sauce as those which Hercules carried away from the garden of the Hesperides were cooked in. Up to three o’clock on Saturday they were not captured, when the police were obliged to abandon the pursuit. Thus ended this memorable barracoon chase, which caused a good deal of pleasantry to the humorous.